Our product range includes a wide range of current transducer and pt3 three-phase multi-function transducer. We are a remarkable and prominent entity, engaged in offering Current Transducer. This transducer is precisely manufactured using quality proven components at vendors’ end by a dedicated team of experts. The offered transducer is installed in various devices for converting the forms of energy. This transducer is offered to the clients in diverse technical specifications. Fostered with several years of market experience, we are engrossed in offering Pt3 Three-phase Multi-function Transducer. Vendors’ professionals manufacture this transducer with the aid of cutting-edge techniques by utilizing excellent quality basic materials in sync with predefined quality norms. 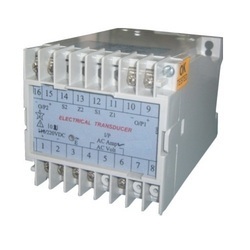 The provided transducer is mainly used in electrical devices for converting energy. Also, the provided transducer is available with us at pocket-friendly rates. PT3 is a range of compact, configurable multiple-input transducers designed to meet the demanding needs of supply utilities and industrial applications. It offers accurate true-RMS measurements and quick response time. It is equipped with up to four load-independent, galvanically-isolated analog outputs that can be configured on site for different input parameters, input range, and output curves. Looking for Current Transducer ?